The Government of Icelandic has offered Ukrainian authorities to identify opportunities in geothermal development in Ukraine as part of the diversification and integrate renewable energy sources in power generation in the country. Earlier this summer (2014) the foreign ministers of Iceland, Mr. Gunnar Bragi Sveinsson, was in Kiev where he met a.o. the President of Ukraine, Mr. Petro Poroshenko. The Icelandic minister also met Mr. Vitaliy Hryhorovskyi, Assistant Director General (First Deputy Head) of the Ukrainian State Agency on Energy Efficiency and Energy Saving (SAE). At the meeting with Mr. Hryhorovskyi it was decided to begin preparations for cooperation between the countries in the field of geothermal utilization. Icelandic foreign minister stressed that there may be opportunites for the exploitation of geothermal energy in western Ukraine. Icelandic scientists and experts have very broad knowledge and experience regarding geothermal exploration and utilization, and may be able to assist Ukraine in geothermal development. The minister added that harnessing geothermal energy, as a pure and stable resource, can prove valuable to Ukraine’s inhabitants, especially for heating purposes. In a recent article in the Financial Times, it was pointed out that European industrial electricity prices are about twice as high as in the USA (and natural gas prices in Europe are around three times higher than in USA). However, there is one country in Europe that offers even more competitive electricity prices than available in the USA. This European country is Iceland. The largest energy firm in Iceland, Landsvirkjun, offers electricity at a fixed price of 43 USD/MWh. Contracts like that are available for up to 12 years. This price is substantially lower than average wholesale electricity prices on spot markets in the USA. 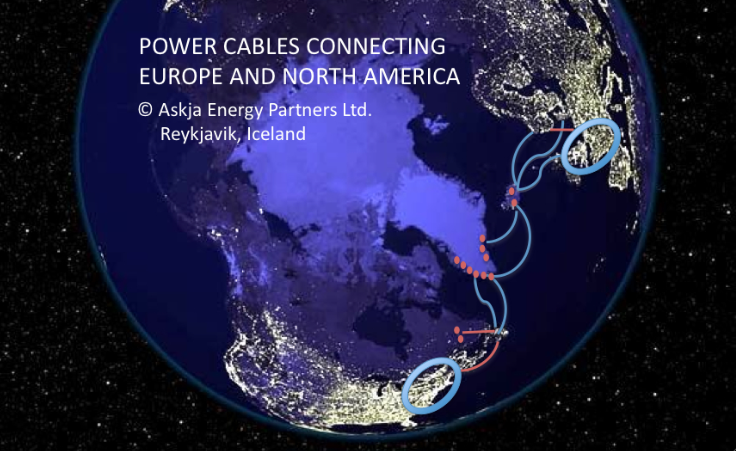 And it seems evident that electricity prices in the USA will rise in the coming years, making Icelandic electricity even more competitive than it is already. In recent months and years the USA has experienced very low electricity prices. In some areas, the wholesale prices for electricity on the spot market in 2012 went down to 23 USD/MWh (in the state of Washington). In Texas they went down to 36 USD/MWh and down to 40-47 USD/MWh in the Northeastern parts of the country However, since then the prices have in general been rising again. The low electricity prices experienced in the US lately are mainly due to fast increased supply of natural gas, as a result from the booming shale gas industry, meaning lower wholesale prices for natural gas. 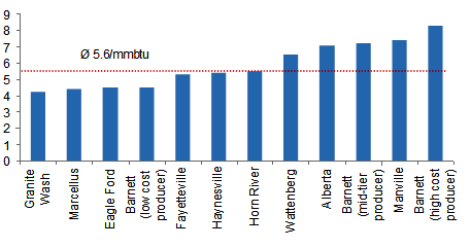 In numerous cases the natural gas prices have been below production costs, which is the result of to fast investment and oversupply of gas. The US Energy Information Agency (EIA) is expecting price increases for natural gas, when the market becomes more balanced. This will inevitably make wholesale electricity prices in the USA substantially higher than they have been in the last couple of years. 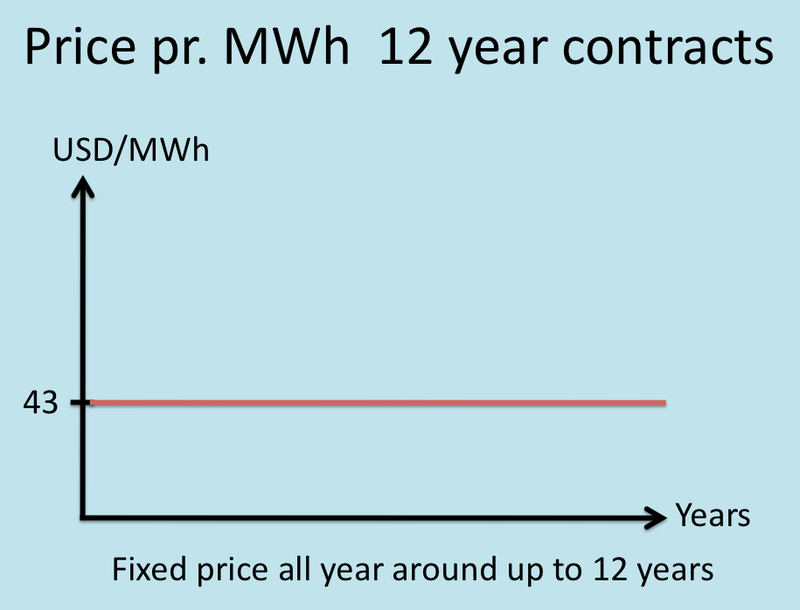 The LCOE tells us what the price for electricity generated from a specific source must be to break even over the lifetime of the energy project. Thus, the LCOE can be said to reflect the necessary minimum long-term wholesale price from a given power plant, for the plant to achieve a certain minimum profit (usually an IRR of 10%). LCOE can also be described as equivalent to the long-run marginal cost of electricity at a given point in time, because it measures the cost of producing one extra unit of electricity with a newly constructed electricity generation plant. Unless electricity price (wholesale) is expected to achieve the said return (usually an IRR of 10%), new power plants will normally not be constructed. Thus, LCOE in fact gives an estimate of the expected future average price of electricity as traded on a wholesale electricity market within the lifetime of the project. According to the US Energy Information Agency (EIA), the minimum levelized cost for new power plants operational in 2019 will be 64.4 USD/MWh (for natural gas plants – note that the cost will actually be lower for plants utilizing geothermal energy but they will be on a fairly small scale). 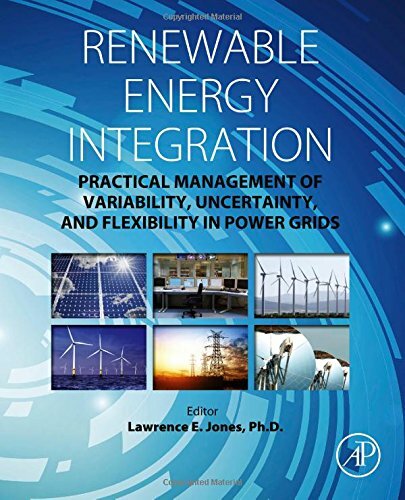 Thus, although it is impossible to predict with great accuracy what the electricity prices will be at a certain point in the future in the dynamic markets of the United States, it seems very likely that wholesale electricity prices in the US will rise substantially. The construction of necessary new power plants will hardly happen unless the average wholesale electricity prices will rise towards at least close to 65 USD/MWh. It is important to keep in mind that for many power plants the LCOE will be somewhat higher than the said 64.3 USD/MWh (in some cases much higher, such as for coal, and nuclear plants). And the EIA specifically states that other institutions and consultancy firms are projecting even higher minimum LCOE for new power plants than the EIA tself does. 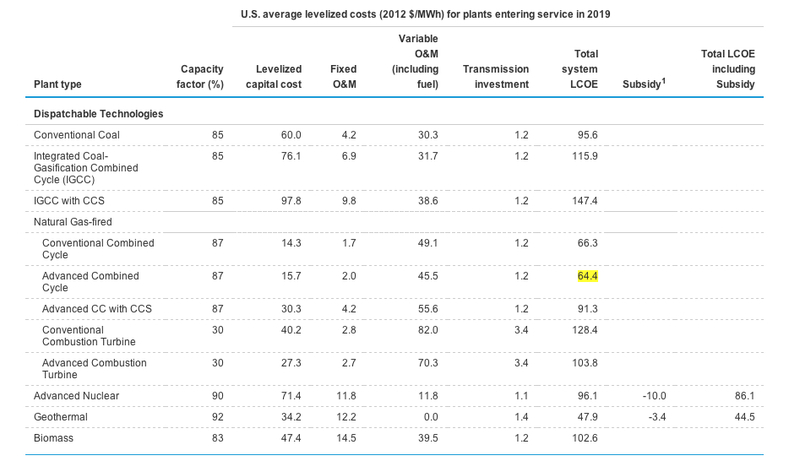 According to the EIA, there are examples of projections stating 76 USD/MWh as the minimum levelized cost. 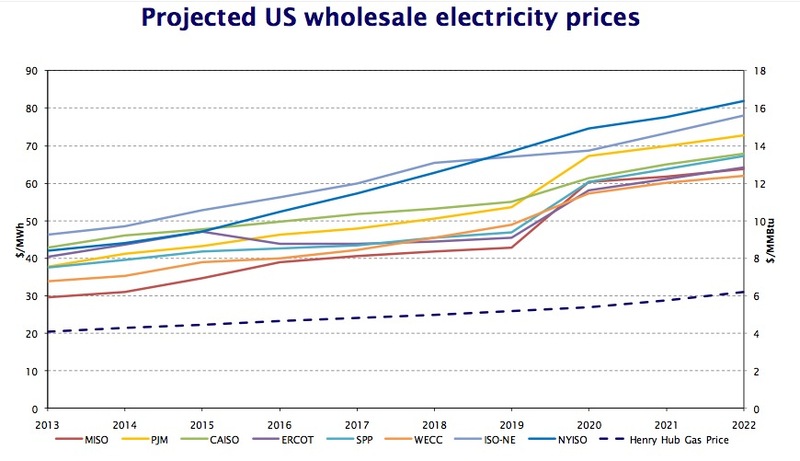 Thus, the minimum LCOE in the USA in 2020 can be said to be expected within the range of 65-76 USD/MWh. The major driver for higher electricity prices in the predictions is the steady (yet moderate) expected increase in natural gas prices. So the minimum LCOE of 65-76 USD/MWh reflects the different projections of LCOE for power plants running on natural gas. For those power plants to be built, the wholesale price of power will have to rise towards at least 65-76 USD/MWh. So rising electricity prices in the US seems inevitable. And actually, this lowest rate will probably only be available to industrial users – the prices will be somewhat higher for most services and homes. The least costly electricity source (natural gas) will not meet all the demand for new power sources in the US. At peak periods the electricity prices will be quite a lot higher, as coal plants and hydropower is needed to meet demand for electricity (nuclear- and geothermal plants will sell into the system at all times, adjusting to the price floor set by natural gas plants, and wind- and solar will of course influence spot prices by feeding the system whenever the wind blows and/or whenever the sun offers energy to PV or CSP solar plants). 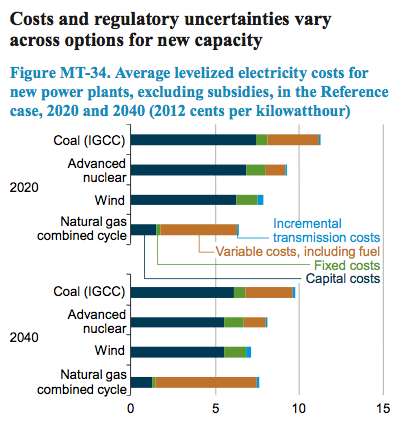 On average, nuclear plants, geothermal power, wind power and grid-solar will need higher prices than the natural gas plants (because of higher LCOE). Thus, the average wholesale electricity prices in 2020 will need to be somewhat higher than the earlier mentioned 65-76 USD/MWh. Iceland is the worlds’ largest electricity producer (per capita) and also it has numerous low cost hydro- and geothermal power potentials yet to be harnessed. This creates tremendous opportunities – at times when electricity prices in the US are heading towards 65-76 USD/MWh. Iceland’s renewable natural energy sources offer great potentials to produce green electricity at very competitive prices. 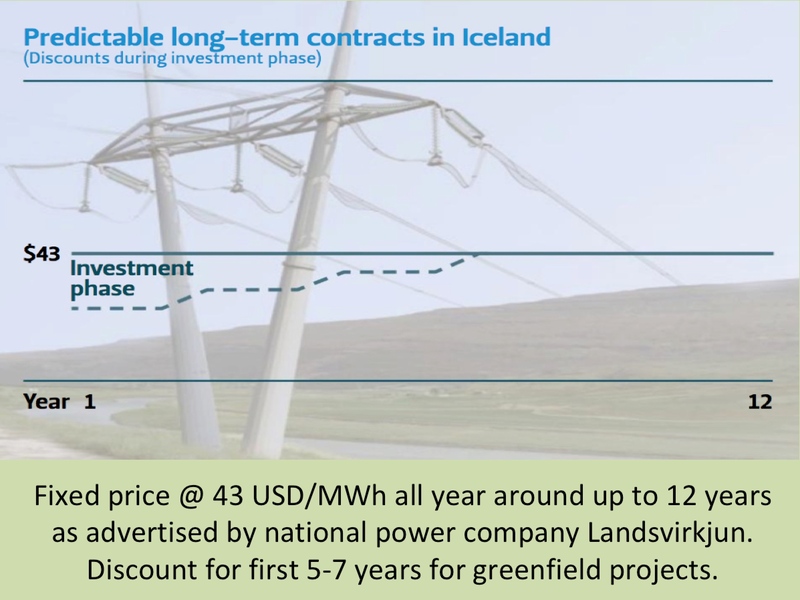 That’s why the Icelandic National Power Company (Landsvirkjun) is able to offer up to 12 year contracts at only 43 USD/MWh. Companies in need of substantial amounts of electricity for their production or services (such as data centres or silicon plants) will hardly find as attractive long term deals anywhere else in the traditional free market economies. 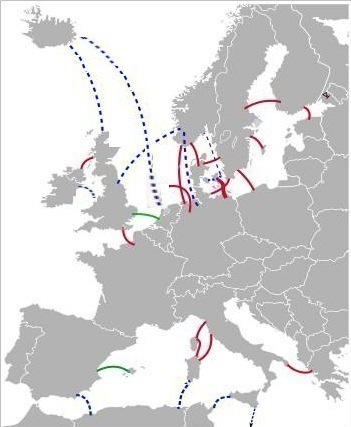 Therefore Iceland may be the best option.